Inspired by a strong passion for competition, the Fjord 36 open is the perfect combination of a performing hull and a clean and sophisticated design that has always been a trademark of designer Patrick Banfield. 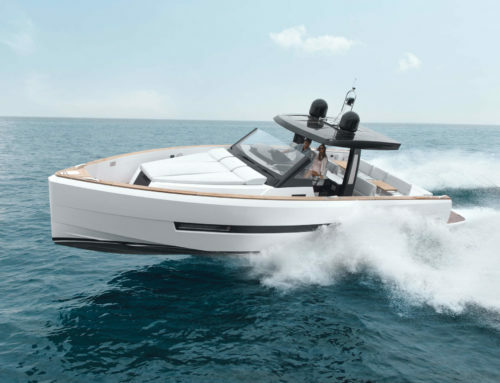 With the Fjord 36 open you will get an elegant, fast and safe powerboat merged with a spacious open deck, and a perfectly integrated cabin that ist equipped with toilet, stove, refrigerator and king-size bed. 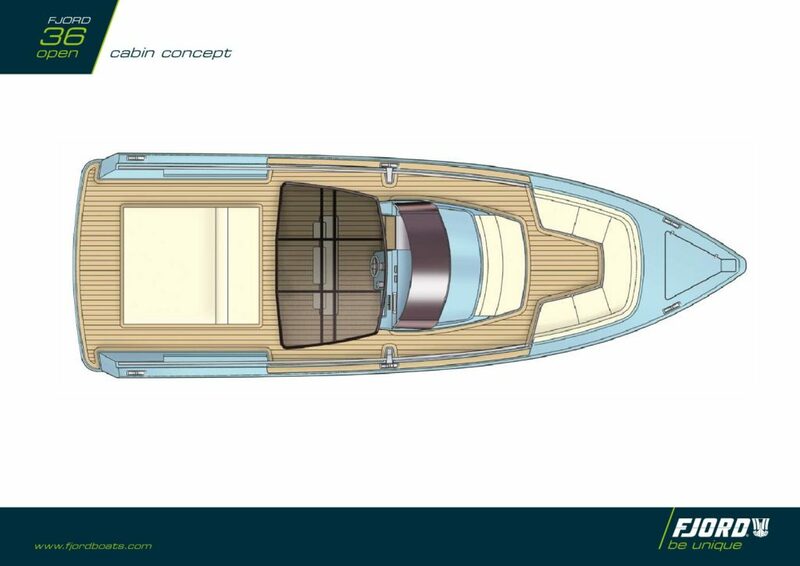 New exciting design, shaped like no other yacht with her almost vertical bow and long, crisp lines frameless windshield gives unlimited open feeling individually hand-built for the client by boatbuilding craftsmen consequently every FJORD 36 open is unique, a beautifully customized one-off. 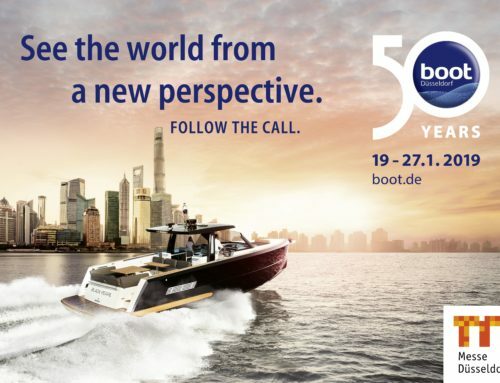 Whenever you enter a port with the Fjord 36 open, you will be met with admiring glances. The clear, linear design makes the Fjord 36 open unique. 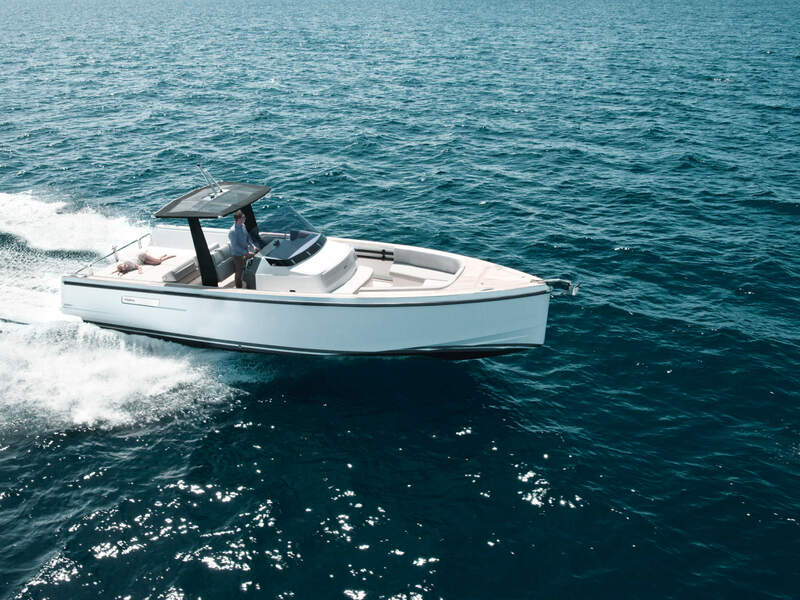 The bow stretches up almost vertically and says: “Here I come.“ The parallel running lines of the water pass, bulwarks and bimini top give the boat a sense of simple, expressive elegance. You could also say: less is more. Excellent performance and efficiency in all conditions, even the most extreme! 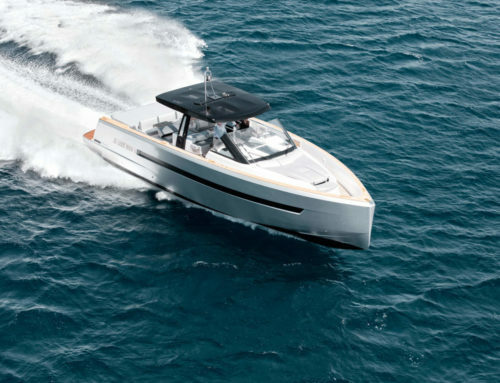 up to 42 knots, great feel and high fun factor long range capability. 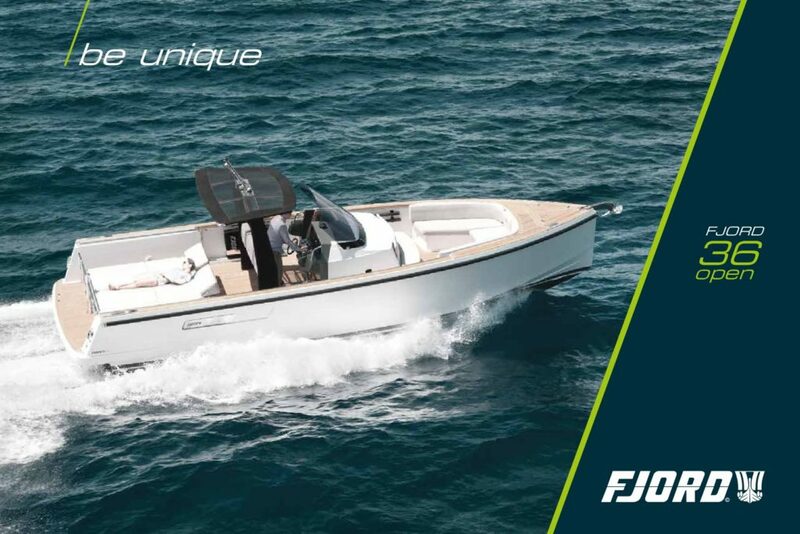 The Fjord 36 open‘s maximum speed is an impressive 42 knots perfect for discovering hidden beaches and ideal for a fast trip to that idyllic restaurant in the next harbour. Its power is generated by two modern Volvo diesel engines with a performance comparable to V8 big-block petrol engines but with half the fuel consumption. Easy handling and precise docking with joystick control functional – tremendously dry with great storage, whether space for diving equipment or for wake boarding crew friendly: low maintenance, flush decks along with superior materials such as sunbrella fabrics and quality build components. Comfotable handling and adequate reserves of power guarantee many unforgettable hours on board of the Fjord 36 open. Wether you want to cruise off into the sunset or enjoy a day‘s waterskiing. Once you‘re at your destination, the driving pleasure is still not over: the joystick will help you to berth the FJORD smoothly, exactly where you want. 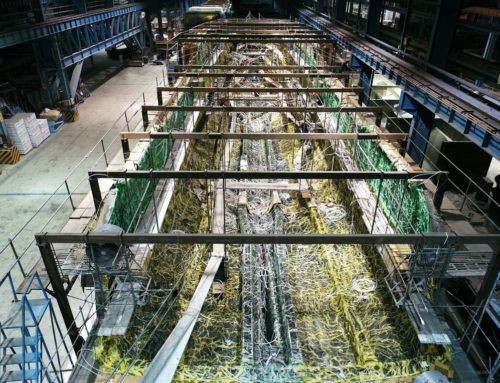 Hull coming from a serial production, proven boat designed by Patrick Banfield huge bulwarks to make the stay on board a more safe one kitchen, bar with refrigerator, helm station all on one level spacious, comfortable seating areas for passengers large relaxing spaces for lounging with unique shade options. You can be relaxing on the water with the Fjord 36 open in no time at all. 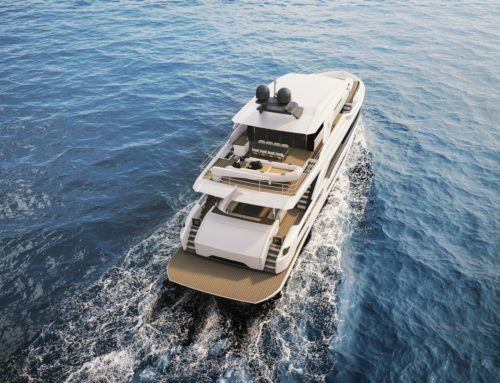 Once its two powerful Volvo engines have got delivered you far enough offshore, you relax on your king size sun lounger – or have a party with friends. You‘ll have to reach for the cold drinks from the big refrigerator yourself but the admiring looks from your guests will be absolutely spontaneous. For the well-being of all on-board. The bathroom with electric toilet. The cockpit: your lounge- and dancing-area. Audio control station: perfect sound from anywhere. The teak fixtures: from the front and side deck to the engine hatch. Well protected: covers for seating. Anchor rail with electric anchor winch. Extra kitchen with refrigerator in the cockpit our options at your choice. 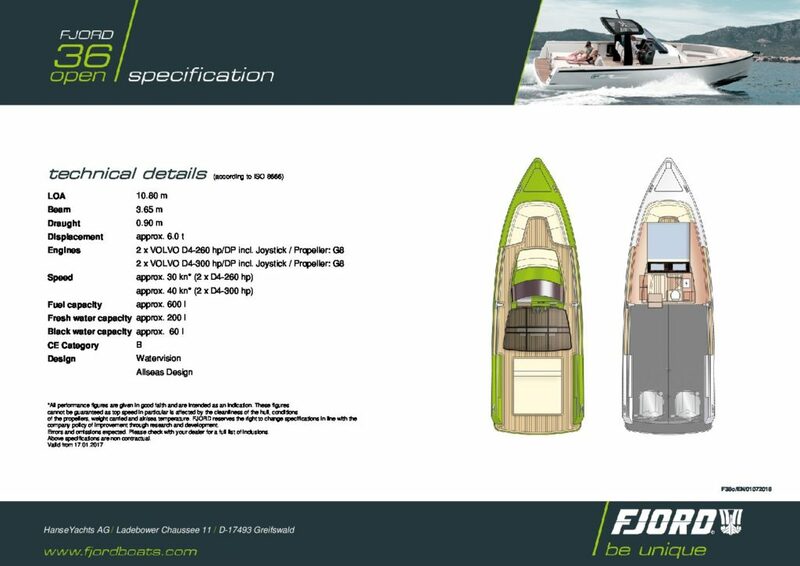 To make the unique feeling on your Fjord 36 open complete, simply choose from a wide range of options. From the electric anchor winch and the sound system through to the bathing platform extension. Due to the impressing range of special gadgets, smart devices, useful details and engine options, individualising your FJORD 36 open can be as enjoyable as driving her. The FJORD 36 open is sure to be to your liking whilst maintaining incredible uniqueness.